RIO DE JANEIRO, BRAZIL – Even though Mexico and Japan have already been eliminated from the Confederations Cup‘s Group A, both teams put on a lively fight at Belo Horizonte’s Mineirão stadium, with Mexico winning 2-1 over Japan. Javier “Chicharito” Hernández is about to score his second goal, photo image recreation. The final result means that Mexico goes home with three points and the Japanese side leaves with no points, despite putting on a great performance and scoring three goals against Italy, as Brazil and Italy move on to the next round. The Japanese entered the game with the same energy they showed in their battle against Italy and nearly scored after eight minutes. Endo’s strong strike was deflected by Okazaki who was ruled off-side. With time, the Mexicans grew stronger and kept pushing for the goal, but they had to wait until nine minutes into the second half-time to finally score. It was Manchester United’s Javier Hernández who brought the ball behind Japanese goalkeeper, Kawashima, with a strong header after a pass from Giovani dos Santos. The Mexican side continued putting on the pressure and only twelve minutes later, it was Javier “Chicharito” Hernández who headed the ball into the goal. The pass for the goal, this time from a corner, came again from Giovani dos Santos, whose ball was deflected before it found man of the match Chicharito. 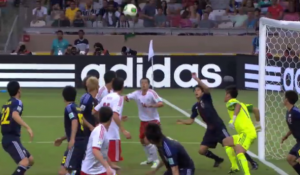 However, the Japanese team was nowhere near giving up. The second goal for the Mexicans served as a wake-up call and the final minutes of the match became intense. Four minutes before the final whistle, Shinji Okazaki scored after a fine pass from Endo. Only minutes later, Hernández was brought down in the box and awarded a penalty. Nevertheless, he missed his opportunity, shooting into the hands of Kawashima and his successive strikes only finding the crossbar. In this manner, the game of honor for third place in Group A came to an end with a 2-1 win for Mexico over Japan. Although both teams are set to go back home, they showed spectators that they are two fine teams to watch out for in 2014’s World Cup.